A Sandwich Sushi Roll is fresh, healthy and delicious! 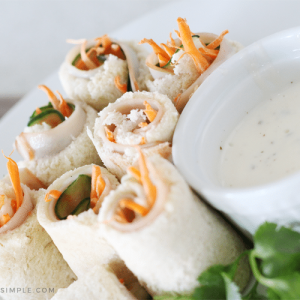 A simple snack or lunch that the kids will love! Prepare your ingredients by cutting off the crust of each bread, then flattening it with a rolling pin. Use a vegetable peeler to make thin slices of your carrot and cucumber, and use a knife to cut your string cheese into strips. Spread ranch dressing over the entire slice of bread. Lay a piece of turkey on top. Make sure you cover the whole piece of bread then fold over the extra. Layer your cheese and veggies on top of the turkey in a pattern- carrot, cucumber, cheese. Then repeat once more. Roll Up the bread, cut off both ends so they are straight, then cut the bread in half, making 2 rolls from each piece of bread. Serve it with ranch or your favorite dipping sauce... and that's it!